Cost to have a chimney cleaned varies greatly by region (and even by zip code). Get free estimates from chimney, duct and vent cleaning contractors in your city. Cost to have a chimney cleaned varies greatly by region (and even by zip code). Get free estimates from chimney, duct and vent cleaning contractors in your city. The average cost of cleaning a chimney is $100 - $500​. Over time, a chimney can get coated with creosote, a flammable substance that is a byproduct of burning wood. Since even a small amount of creosote is enough to cause a chimney fire, it is very important to have your chimney inspected before you use your fireplace. Periodic chimney cleaning will also help ensure that your heating system is in proper working order and operating as it should. According to the Chimney Safety Institute of America, you should have your chimney cleaned if there is a quarter inch of soot buildup or earlier if there is any glazed creosote. The National Fire Protection Association Standard 211 says that chimneys, fireplaces, and vents should be inspected annually to make sure they are sound, free from deposits, and have correct clearances. Even if you have not been using your fireplace, it is possible that birds, squirrels, or other animals have set up nests inside your chimney, making it unsafe to use. The ideal time to schedule chimney cleaning is towards the end of winter or spring. 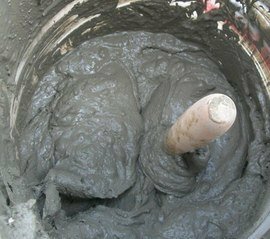 This is because humidity, when mixed with creosotes in the chimney, can produce foul smells as well as form highly corrosive acids that can damage fireplace mortar 1. While some homeowners attempt to clean their chimneys themselves in order to save money, this is a job best left to professionals. Professional chimney sweeps have access to the proper equipment for cleaning a chimney and knowledge about the best methods for cleaning different types of creosote. In addition to cleaning the fireplace and checking the firebox 2, liners 3, smoke chamber, and flue 4, most chimney sweeps also do a Level 1 top-to-bottom, interior and exterior inspection and advise the homeowner on the chimney’s proper operation and condition. On an average, chimney cleaning in the US costs between $100 and $300. The cost of cleaning a chimney depends on a number of factors including the accessibility of the roof, how often you use your fireplace, and how much time has elapsed since the last cleaning. For example, if you are in the habit of using your fireplace at least four times every week, you will have to have your chimney cleaned more often to avoid buildup. Similarly, if you have a particularly steep roof that is difficult to climb on, you may be charged extra. If you haven’t had your chimney cleaned for a long time, you may be charged more for the initial cleaning and less thereafter. While the cost of cleaning the chimneys on fireplaces and wood stoves are comparable, you may have to pay more to clean a wood stove if the flue is in an odd shape and difficult to access. The Chimney Safety Institute of America and The National Fire Protection Association classify inspections in their NFPA 211 Standard for Chimneys, Fireplaces, Vents, and Solid Fuel-Burning Appliances classifies inspections as Level 1, Level 2, and Level 3. If you have been using the fireplace regularly in the past without any problems, you may qualify for a Level 1 inspection, which is most common and least expensive. If you are making any changes to your system, such as switching to a new fuel type or relining the flue 4, or have had any major events like an earthquake or a building fire, you will need a Level 2 inspection. A Level 2 inspection is also done before you sell a house. A Level 2 inspection does not require any special tools or equipment to open any doors or coverings. It will also not involve removal or demolition of permanent parts of the chimney or building structure. A Level 3 inspection is usually carried out when there are suspicions of serious damage. Level 1 inspection plus inspection of roof, attic, and crawl space. 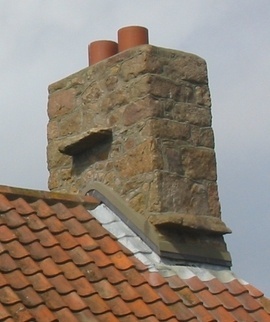 Traditional masonry chimneys have a brick or stone firebox 2 (where the wood is burned), a brick flue 4 (the airshaft running from the firebox to the top of the chimney), and a cap to prevent water and animals from entering the chimney. Most prefabricated chimneys are made of metal and have a metal flue. Both types of chimneys will also have a damper - a moveable metal plate that will allow the smoke from the fireplace to exit into the flue. Chimney liners 3 are mandatory in some states. They protect the masonry from the corrosive byproducts of burning wood and ensures that the heat and fire remain within the fireplace and the chimney. They are made of materials that can tolerate heat such as metal, clay, or ceramic. You can prepare for a chimney cleaning at home by making sure the chimney sweeps have easy access to the fireplace and the chimney. Move any furniture or decor items. Your chimney sweep may also ask you to not use the fireplace at least 24 hours before the cleaning. The chimney sweep will use protective coverings to protect surfaces from soot. They may also lay down runners to prevent tracking soot through the house. Chimney cleaning professionals may charge a flat rate for the job ($100-$300) or charge by the hour at the rate of $75 per hour. If you are planning to clean your chimney yourself, you should have the basic cleaning tools such as a brush and rod set, a shop vacuum, a sturdy ladder, a safety harness, a hand brush, safety goggles, a chimney brush, a respirator or dust mask, and a few tarps or drop cloths to cover the area around the fireplace. You can improve the life of your fireplace and chimney by following a few basic steps, such as cleaning ashes as soon as they accumulate and using only dry or properly seasoned wood. As a rule, never burn painted wood or pressure-treated wood in the fireplace as they can release toxic fumes when burned. Always remember to open the damper fully before starting a fire in the fireplace. Wood stoves also have chimneys that have to be cleaned periodically. Wood stoves that have been operated under ideal conditions will have a gray-colored ash as the main residue. However, if you notice shiny residue accumulating inside the door, it may be time for a cleaning. On an average, wood stove cleaning costs around $100. Wood stove inserts that do not have liners 3 running to the top of the chimney will have to be pulled out for access, adding an additional $50 to the cost. Insert pipes that have to be removed for cleaning will increase the cost by around $20. If your chimney inspection reveals a lot of bad mortar 1 joints, you will have to take the chimney down and rebuild it. If the bricks are in good condition and without cracks, you may be able to reuse them. If the damage to the chimney is minor, you may want to consider repointing. Replacing a chimney liner is expensive and can cost between $2,500 and $5,000. Chimney cap installation can cost between $150 and $700, including materials and installation. Flashing 5 repairs typically cost between $250 and $500. A new damper can cost between $100 and $500. Installation fees vary depending on whether the damper was bolted to the brick, which allows for easy removal, or was secured with mortar. Labor is more expensive in the latter case and can range from $200 and upwards. Removal of animals from a chimney can cost around $300 and $500 on an average. Creosote logs cost around $15 per piece. Stove inserts without liners 3 extending to the top of the chimney will have to be pulled out for easy access. Any insert pipes that will have to be removed for cleaning will increase the cost by around $20. Some chimney sweeps may offer a camera inspection during a cleaning for an additional cost of $50-$75. Some homeowners choose to clean their chimneys themselves in order to save money. 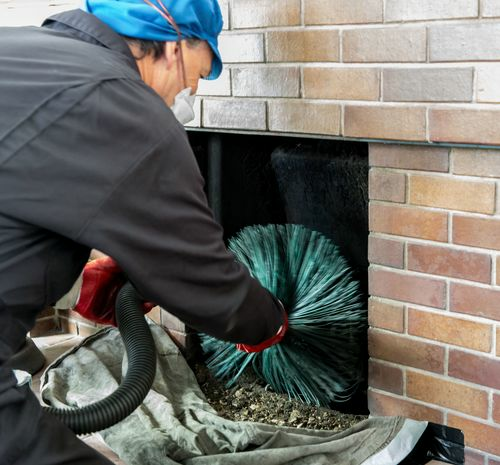 However, if the smoke chamber in your fireplace is too hard to reach or if you do not have experience working on top of a roof, it would be better to hire a certified chimney sweep. If you are cleaning your own fireplace, you can sprinkle the ashes and creosote on flower beds or add to the base of your houseplants. They are a good source of calcium and other nutrients for plants. Trees that overhang the chimney should be trimmed back to avoid damage to the chimney from falling branches. Tree trimming costs can range between $75 and $500. When hiring a chimney sweep, look for a certified professional who has taken a test on chimney standards and codes and understands how they are supposed to be constructed. They should also have insurance and workman's compensation in case of an accident. To prevent creosote from accumulating, take care to burn only dry wood. 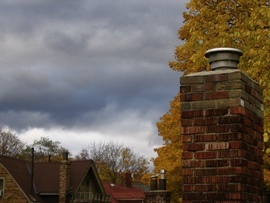 Make sure you have a chimney cap put in to stop rain, snow, sleet, leaves, and animals from getting into the chimney. Maintaining chimneys capped, clean, and free from cracks and leaks is essential to preventing water damage and litter from getting inside the chimneys. This will also decrease the possibility of developing serious, more expensive problems later on. Though gas fireplaces do not create the same buildup of soot and creosote as wood-burning fireplaces, professionals still recommend annual inspections. Be on the lookout for scammers who offer ridiculously low prices for cleaning chimneys. They may lie about structural damage to the chimney, show you pieces of litter that they claim were found in the chimney, or attempt to convince you of the need for new chimney caps or liners. In order to protect yourself, always ask for references and verify them. Do not be taken in by the low prices. Get at least two or three quotes before making your decision. Also, make sure the company is licensed and employs certified individuals. Do the chimney cleaning logs work? Chimney cleaning logs do not completely clean the chimney. Instead, it helps to break down the creosote buildup inside the chimney, making it easier to clean later. On an average, you can expect to pay between $100 and $300 to have your chimney swept. How do you clean your chimney? Ideally, chimneys should be cleaned by certified chimney sweeps who understand how chimneys are built and have access to the necessary cleaning tools and equipment. However, if you can access the chimney smoke shelf or smoke chamber area in your fireplace, you may be able to do a DIY job. Choose a brush that can be easily maneuvered in the fireplace and the flue 4 to clean up to the top. If there is soot or creosote accumulation on the rain cap, it will also have to be cleaned. While most of the work can be done from the fireplace, you need to make sure you can see through the rain cap from the ground without any blockages. To clean the chimney cap, you will have to get up on the roof. This is not a job for novices and is best left to the professionals. To prevent chimney fires, chimneys should be cleaned annually or if there is a quarter inch of soot buildup. How much is it to clean your chimney? On an average, chimney cleaning costs between $100 and $300. According to the Chimney Safety Institute of America, you should have your chimney cleaned if there is a quarter inch of soot buildup or even earlier if there is any glazing. 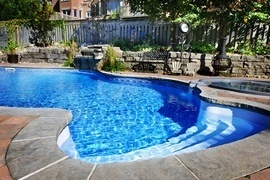 3 Liners: A covering, usually made of vinyl, for the walls and floor of a swimming pool, used to keep the water in and protect the pool's surface. How much does it cost to have a chimney cleaned in my city? Cost to have a chimney cleaned varies greatly by region (and even by zip code). To get free estimates from local contractors, please indicate yours. The chamber in a fireplace that contains the fire. It is usually lined with firebrick so it can withstand the extreme heat that it is exposed to. Manufactured fireplaces have fireboxes made of sheet metal. Cost Considerations: A factory-built fireplace costs about $2,000 to $5,000, making it a more affordable option than adding a masonry fireplace, which can cost $10,000 or more. It is also less expensive to repair. A duct or pipe through which exhaust gases from a fireplace, stove or boiler are released to the outdoors.